A R33 Skyline GTS25t built for show an' go! In most cases, a person's first car is usually something pretty crumby – the subject of much laughter once they've moved on to their second or third car. 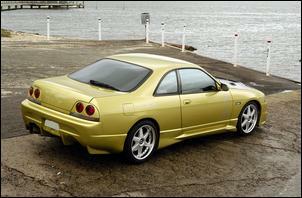 But not Matthew Rotolo’s first car - it's this amazing Nissan R33 GTS25t. Matthew purchased the Skyline a few years ago as a purple painted stocker and, while most people were busy saving cash to upgrade to a better car, Matthew was moulding the Nissan into something special. It helps that last year he had “money to burn”! The first thing you’ll notice is the car is no longer purple. 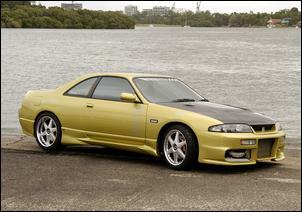 The Skyline has been stripped back to bare metal and draped in a custom mixed House of Colour gold. The normally pedestrian Skyline panels have also been tweaked to add even more appeal. You’ll find a modified Veilside body kit, shaved door locks, carbon fibre pillar trims and a Do-Luk spoiler-less boot lid (which effectively smooths the rear-end styling). A carbon fibre bonnet has also been fitted along with a GT-R grille and, if you look closely, you might notice the custom Godzilla-style GTS badge. Very neat! With 187kW at the flywheel in standard guise, the Nissan R33 GTS25t is no slouch – but with the mods given to Matthew’s example you’re looking at around double the factory output. This is a combo capable of more than 300kW at the wheels on around 1.4 Bar boost. All engine modifications have been performed by BD4s Service Centre in Sydney. Internally, the Nissan RB25DET is stock with the exception of GT-R N1 oil and water pumps, HKS head gasket, mild HKS camshafts and adjustable sprockets. 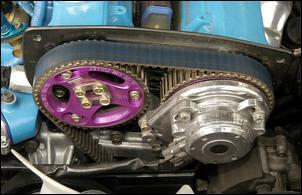 A Trust high-strength cam belt is also fitted to minimise the risk of catastrophe. A Trust aluminium radiator with silicon hoses keeps the RB running cool while a Cusco catch-can prevents blow-by sludge entering the intake. Breathing and throttle response are enhanced with a Trust/GReddy single throttle intake manifold and plenum. Induction air is hustled through a HKS Type S front-mount intercooler system with a HKS blow-off valve mounted immediately before the throttle. Boost pressures up to 1.5 Bar are generated by an off-the-shelf HKS turbocharger mounted on the stock exhaust manifold. The HKS compressor inhales through a HKS Power Flow air filter while the turbine blows into a mandrel bent exhaust; not much restriction at either end. HKS 550cc injectors, a Sard pressure regulator and upgrade fuel pump provide the necessary juice while tuning has been performed by BD4s using an A’PEXi Power FC programmable ECU. 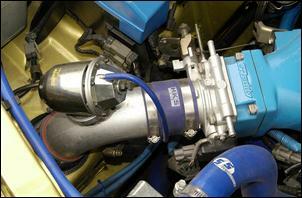 Boost pressure is controlled by a stand-alone HKS EVC5 unit. With a massive increase in engine torque, an OS Gikken twin-plate clutch and two-way diff are necessary to get the goods to the bitumen. Anything else would either break or slip. Matthew says he’s recently switched to a set of Toyo RA-1 road-legal semi-slicks which give the rear-drive Skyline incredible adhesion – it’ll hook up properly even in first gear (so long as you don’t provoke wheel spin). The tyres were supplied as part of a sponsorship deal with Toyo. The suspension department is improved with Whiteline supplied coil-overs, rear sub-frame pineapples, upgrade swaybars, castor bushes and steering bushes. A huge HKS Kansai brace strengthens the front suspension towers and a GT-R brace adds beef to the rear. Stepping on the brake pedal awakens the new R34 GT-R NUR-spec Brembos combined high-performance pads and braided Nismo lines. In short, stopping is not a problem! 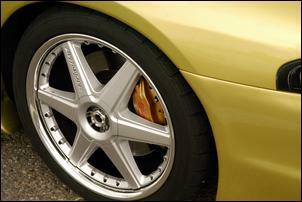 These big brakes live behind attractive 18 x 8 and 18 x 10 Racing Hart Type CR rims. Indoors, Matthew has added a Clarion television (complete with X-Box) and a Pioneer head unit wired to Boston speakers. 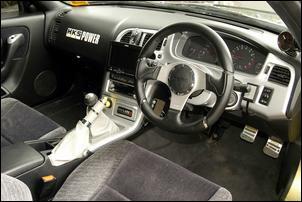 A Momo steering wheel and pedals, a custom painted dash and A-pillar mounted boost gauge are the only other changes. Defi gauges have been added since our photo shoot and Matthew is about to install Bride seats with matching Bride trim throughout the cabin. It should look spectacular. But guess what time it is. Time to sell. Understandably, parting with this first car won’t be easy!